CATHOLIC GIFT SHOP LTD - Lourdes Laser Key Ring & Rosary Gift Set. Lourdes Laser Key Ring & Rosary Gift Set. Lourdes Laser Key Ring & Rosary gift set contains. 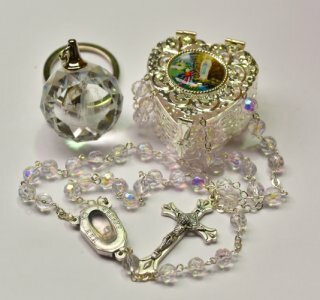 > Glass crystal rosary beads with a Lourdes water centrepiece that depicts the scene of the apparitions. Rosary measures 18 inches approx..
> 3-D laser crystal apparition round key ring.